The Modify Frame Properties command allows you to modify the layer visibility and opacity for the currently selected animation frame or for all the animation frames at once. This option allows you to change the layer properties for all frames at one time. 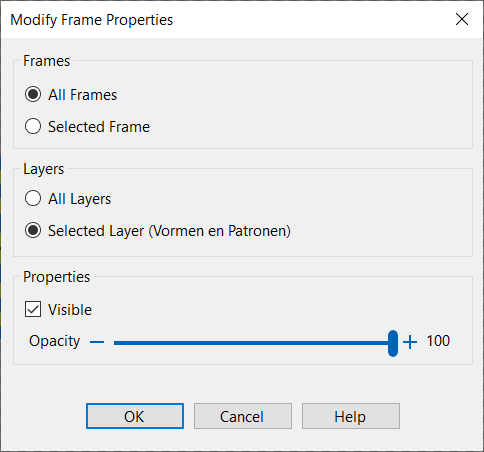 Use this option to change the layer properties for the selected frame only. This option allows you to change the properties for a frame for all layers at one time. Use this option to change the properties for a frame for the selected layer only. Use this option to change the visibility property. This option allows you to change the opacity property. Opacity is the opposite of transparency. If something has an opacity value of 100%, that means it’s completely visible. An opacity value of 0% indicates that an object is completely transparent.